Toll-Like Receptor 4 and Heat-Shock Protein 70: Is it a New Target Pathway for Diabetic Vasculopathies? Diabetes is one of the most concerning diseases in modern times. Despite considerable advances in therapeutic management, the prevalence of diabetes and its contribution to death and disability continue to be a major health problem. Diabetic vasculopathies are the leading cause of mortality and morbidity in diabetic patients. Its pathophysiology includes oxidative stress, advanced glycation end products, and a low-grade inflammatory state. Lately, actions of the innate immune system via Toll-like receptors (TLRs) have been suggested as a new insight in this field. TLRs are pattern recognition receptors activated by highly conserved structural motifs of exogenous or endogenous ligands. Heat-shock proteins (HSPs), normally known for their ability to protect cells during stressful conditions, when released from injured cells bind to TLR4 and trigger the release of pro-inflammatory cytokines in a MyD88-dependent pathway. This pathway had been investigated in pancreatic beta cells and skeletal muscle, but it has not yet been explored in the vascular system and deserves investigation. In this work, the interplay between TLR4 and HSP70 in the vasculature during diabetes is reviewed and discussed. 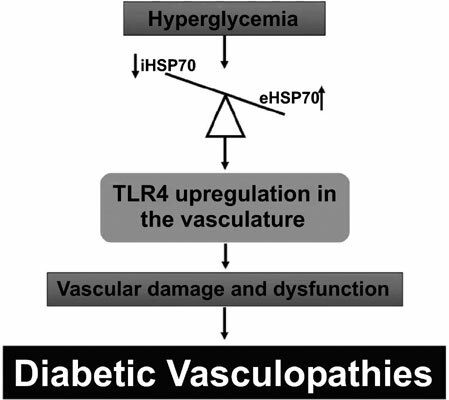 The current literature and preliminary results from our laboratory led us to hypothesize that hyperglycemia-associated HSP70 plays an important role in the pathophysiology of diabetic vasculopathies via the TLR4 pathway and might be a new target for therapeutic intervention. Hyperglycemia, toll-like receptor 4, heat-shock protein 70, pro-inflammatory cytokines, endothelial dysfunction, diabetic vasculopathies.